All forms are due back to the UW-Extension office by September 15th. A committee will be meeting shortly after the deadline to select the award recipients. New Teen Award: The new teen award nominations are open to 4-H members in grades 7-9. This individual should display good leadership skills, sportsmanship, a positive attitude, a willingness to help others, and dedication. He/she should serve as a positive role model and mentor to other youth. This person should be involved at the club, project, county and maybe even beyond. Outstanding Teen Award: The outstanding teen award nominations are open to 4-H members in grades 10-13. This individual should display good leadership skills, sportsmanship, a positive attitude, a willingness to help others, and dedication. He/she should serve as a positive role model and mentor to other youth. This person should be involved at the club, project, county and maybe even beyond. Outstanding Leader: Any current 4-H leader may be nominated for this award. Do you know a volunteer leader that continually goes above and beyond for the organization? Someone who embodies what the 4-H program is all about? A volunteer that has made a difference in the lives of youth, other adults, or the community at large through the 4-H program? Then be sure to nominate this person for the outstanding leader award. Friend of 4-H: This is for any person, business, or group that is not currently part of the 4-H program that has been a partner or has provided a great deal of support to Kewaunee County 4-H. Outstanding Club/Project Member: Each club/project should select one outstanding member from their club/project membership. This individual should display good leadership skills, sportsmanship, a positive attitude, a willingness to help others, and dedication. Each club/project is asked to select one member and submit that person’s name on the Outstanding Club/Project Member form. Each fall, at the annual 4-H banquet, we take time to recognize the youth leaders, adult volunteer leaders, and community members that have made an impact on the 4-H program. The prestigious Key Award is one of the highest recognitions a 4-H member can receive and honors a select group of 4-H participants from throughout the state. The members receiving this award demonstrate consistent growth in their 4-H involvement, develop and apply their leadership skills, and actively participate in multiple facets of the 4-H program. 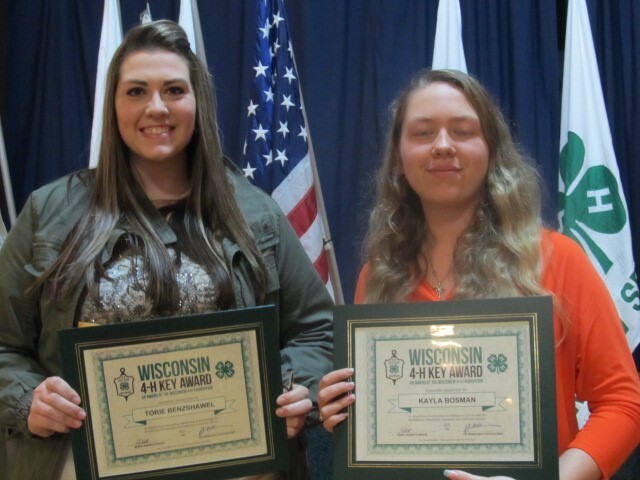 Kayla Bosman, Luxemburg and Torie Benzshawel, Casco are the 2016 Kewaunee County recipients of the Wisconsin 4-H Key Award. 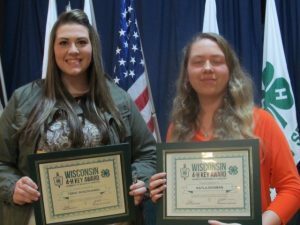 According to Jill Jorgensen, Kewaunee County 4-H Youth Development Educator, this year’s winners exemplify the goals and values of the Wisconsin 4-H program. Both Kayla and Torie have been involved in 4-H since they were in elementary school. Throughout the years, Bosman and Benzshawel have been actively involved in 4-H through their clubs, county projects, county committees, camp, the 4-H Teen Board, Legislative Day, and 4-H trip programs. These youth have stood out not only in 4-H, but also in their communities as youth leaders and volunteers. Torie and Kayla both commented on the impact that 4-H had on shaping their leadership and life skills to become the individuals that they are today. Torie stated, “Through 4-H I’ve gained more communication skills and confidence that I ever imagined.” Kayla noted, “[4-H] helped me become me. It showed me that I can do amazing things and my voice matters to the world.” Additionally, both recipients noted that they are applying what they learned through their 4-H experience to their future goals and plans. Kayla is currently attending an engineering program through Northwest Wisconsin Technical College and University of Wisconsin-Stout. This spring, Torie will be attending Northeast Wisconsin Technical College and majoring in nursing. Key Award recipients are high school students with at least three years of experience in 4-H and one year as a youth leader. The Wisconsin Farm Bureau and Rural Mutual Insurance Company sponsor the Wisconsin 4-H Key Award program. They have sponsored these awards for over 25 years, helping 4-H to honor some of Wisconsin’s finest youth. For more information about Kewaunee County 4-H contact Jill Jorgensen, Kewaunee County 4-H Youth Development Educator at jill.jorgensen@ces.uwex.edu or at (920)388-7185.